When is an apology not an apology? When it is the British government offering “deep regret” for the supposed misdeeds of its imperial forefathers. 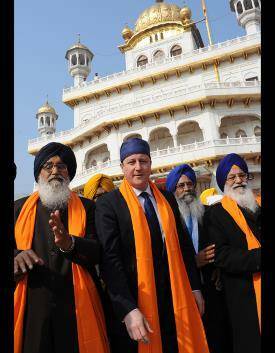 The latest mea culpa comes from Prime Minister David Cameron who has apologised to the Sikh community for Britain’s supposed role during the massacre at their holiest shrine, the Golden Temple in Amritsar during a hostage crisis in 1985. This came as a surprise to everyone, including most Sikhs, who were unaware of any British involvement when the Indian army raided the temple during the clashes which took place nearly forty years after Indian independence. But Prime Minister Cameron has insisted that yes indeed there is something to apologise over. His civil servants had been rooting through the archives and had come up with something suitably incriminating. It turns out that a single British officer was dispatched to the scene at the time of the stand-off and his advice was ignored. So that was the extent of our “colonial interference” on that occasion. Cue fulsome apology. And for good measure David Cameron became the first British Prime Minister to visit the scene of the previous Amritsar massacre in 1919 as depicted in the Oscar-winning film Gandhi. Cameron says he stopped short of delivering a formal British apology but nevertheless expressed “deep regret” for Britain’s role. Both incidents are small beer compared to many other atrocities that have happened throughout the sub- continent’s history not least during partition in 1948. Nevertheless there is a lot of political advantages to be gained from such empty gestures . The Conservative Party will be fighting many UK seats where there are huge Sikh communities at the next election and will get a lot of political credit. The pictures of Cameron in a turban won’t have done any harm either. It was Cameron’s predecessor Tony Blair who pioneered the art of the strategic non-apology apology. Shortly after becoming Prime Minister in 1997 he apologised for Britain’s role in the 1840’s Irish potato famine. Then he prostrated himself before Britain’s multicultural industrial complex by apologising for our role in the slave trade. There are a number of problems with this. First, it involves a certain amount of re-writing of history or at least skipping over inconvenient facts — mainly that slavery has been universal since humans could walk upright and that Black Africans and Arab traders were at least as responsible for this practice long before and after the Atlantic slave trade. It also means overlooking the fact that Britain was the first country in history to abolish the slave trade and that the Royal Navy did a great deal to stamp it out on the seas elsewhere. But to dismiss these apologies as supreme exercises in fatuousness is to miss the point. The value of such posturing is in creating a culture of shame and dishonour over Britain’s colonial past in order to make the British Empire as disreputable as the Third Reich. In other words, they are an essential part of the cultural and moral revolution that has been taking place in Britain since the election of Tony Blair in 1997. In helping to dismantle Britain’s past and destroy the name of the men who built it and who fought to defend it, we are helping to build our post-nation-state multicultural borderless future. In a culture where power flows from victimhood, such empty gestures assume great totemic potency. But there is also a deeper purpose. Continual self-flagellation over the sins of the past is seen as having a necessary therapeutic function in purging society of any lingering trace of unhelpful traditional attitudes. This is all easy to laugh at but is taken very seriously in classrooms, town halls and media such as the BBC. Labour’s innovation of pointless apologies has been enthusiastically adopted by our present Conservative government. The gay community will doubtless have been delighted that a posthumous pardon and apology was issued in 2009 for Alan Turing, the genius mathematician and World War II codebreaker who was convicted of gross indecency in 1952 when homosexuality was still illegal. And more recently Prince William, the heir to the throne but one, has announced his intention of doing away with the Royal Ivory Collection which was collected by sovereigns over the centuries and contains such treasures as a Maharajah’s throne and Royal duelling sword. An apology to deceased elephants will doubtless follow. Last June Britain announced that surviving Kenyans tortured by British colonial forces during the Mau Mau uprising in the fifties, will receive payouts totalling £20m, Foreign Secretary William Hague also announced that Britain would fund a monument to victims of British torture in Nairobi. He said the UK government recognised Kenyans were tortured and “sincerely regrets” the abuses that took place. It was an announcement that warmed the hearts of lawyers in Britain’s booming personal injury industry who will no doubt be in receipt of most of the money. Predictably it is all about pushing diversity. In the anniversary commemorations for the Great War the British government are planning to downplay the role of White soldiers from Canada, Australia, New Zealand and South Africa. More than 80,000 Anzac soldiers died between 1914–1918 fighting for the British Empire in theatres of war as far apart as the Somme and the Dardanelles. But according to News.com.au, British government sources have confirmed in internal briefings that Australia and New Zealand will not be mentioned even once during the commemorations. Instead the contribution of soldiers from countries such as Nigeria, Pakistan, India and elsewhere will play to a “community cohesion” agenda within the UK even if means artificially inflating their actual roles. The Indian Army served on many theatres of war, especially in southeast Asia, mainly in support roles but its record was heavily tarnished by its unfortunate habit — like many mercenary armies — of going over to the enemy. This happened in both world wars. In the Mesopotamian campaign in 1915 Indian Army soldiers switched sides and joined the Turks. After the fall of Singapore, many Indian Army servicemen agreed to join their Japanese captors and man POW camps incarcerating their former comrades in arms. Many even took up arms against the Allies. Most notoriously the Free Indian Legion was recruited by Himmler from captured Indian soldiers in the North African campaign of 1941. Thousands served with “great distinction” in Normandy and were drafted into the Waffen S.S. whom they fought alongside until the fall of Berlin. So what of the other players in Britain’s imperial story who might merit an apology. What about the thousands sent overseas during the Highland Clearances or the convicts deported to Australia. And what about the thousands of Afrikaans women and children who died of neglect and disease in General Kitchener’s concentration camps during the Boer wars? Are they to be forgotten because they are the wrong colour? What is increasingly clear is the only calculation that matters is not what was done but who gains political advantage and making sure the gods of diversity are appeased.